I know many of you have heard me say it before (possibly on one of my webinars) but I need to say it again. The most cost effective marketing tool available to you today is the Internet. The opportunities are endless as to how you can reach your target audience. It’s interesting to think that our world has advanced so far in such a short time when it comes to communication and information. In the past, we had a company brochure and if we were lucky we would update it every 2 -3 years. Today we have our website and we can update it on a daily basis. In the past, we created newsletters and sent them 4 times a year (at most). Today we have blogs and e-newsletters and they can be updated and sent weekly. In the past, we sent direct mail (at a cost of thousands of dollars) once a month (at best). Today we have e-broadcasts that can be sent on a weekly basis (typically for less than $50). In the past, we bought outdoor advertising (ouch! I used to spend $10K a month on 1 billboard in Boston). Today we have button and banner ads for 1/100 of the cost. In the past, we ran commercials on local TV stations for thousands of dollars (plus production, if you wanted something of quality). Today we can web-cam a personal discussion or procedure on youtube at $0. In the past, we attended cocktail parties and charity events. 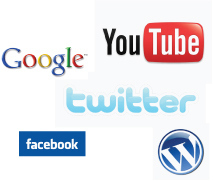 Today we meet on the Internet with social networking: Facebook, LinkedIn and other similar sites. In the past, we worked hard to get speaking engagements for local women’s groups (garden club, country club, rotary, etc). Today we send tweets to all that follow us on Twitter. This list is endless, but clearly everyone can see that the Internet allows us to communicate our message more cost effectively, frequently and efficiently, than we have in the past.